If your smile is suffering from a multitude of problems, it can be easy to feel like it’s too late for you to be helped. You simply don’t know where to start and don’t believe anything can be done. It can be easy to feel overwhelmed, and this prevents many people from getting the care that they need. However, with a full-mouth reconstruction in Chaska, even the most damaged smiles can now be fully restored. We use it to help with the most complicated of cases, and it can completely transform someone’s smile. The beginning of every full-mouth reconstruction starts with making a plan. 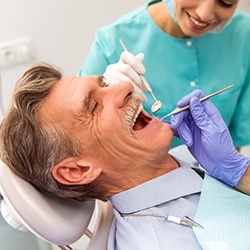 When you visit your dentist in Chaska, Dr. Meschke or Dr. Swingdorf will evaluate your teeth, gums, soft tissues, as well as your occlusion (how your teeth fit together when you shut your mouth). They will then take a variety of x-rays and digital scans to provide them with the information they will use to create your individualized treatment plan. A full-mouth reconstruction involves a variety of procedures working together to restore your teeth’s health and appearance. 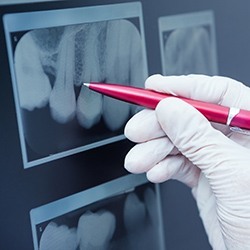 Restorations such as crowns, inlays, or onlays may be used to restore your damaged or severely decayed teeth. These porcelain restorations not only give you teeth that are aesthetically pleasing but functionally strong as well. Your missing teeth can also be replaced with a fixed bridge or completely rebuilt using dental implants. This will all serve to restore your teeth’s basic structure. The next step is to make your smile beautiful again. Chaska Dental Center offers a variety of cosmetic/aesthetic dentistry services that can address any cosmetic issues you may have. Teeth whitening can take years of stains off of your teeth in about an hour, and minor chips and cracks can be fixed quickly using cosmetic bonding. Porcelain veneers can cover a wide variety of flaws with one procedure, and Invisalign can give you the straighter smile you have always wanted without the hassle of braces. No two reconstructions are alike, and the combination of treatments will depend entirely on your needs. The doctors will discuss all of this with you before they form your treatment plan so you can know exactly what to expect before they begin. All of these procedures will help give you a smile that is functional, beautiful, and can be relied on day to day. The doctors will work with you to assure that they give you a smile that will restore both your confidence and self-esteem. They are very proud of the work that they do here at the Chaska Dental Center, and you can see it prominently on display in our Smile Gallery. You can get the kind of results so many people have benefited from already. No matter what condition your smile is in now, be assured that it can be helped. You can walk into our office with hope knowing that you’re finally going to get the care that you need. If you still have questions about how a full-mouth reconstruction works and whether it is right for you, please give us a call today. We’re always available to answer any of your questions.